One should take 11 or 21 Forest Gooseberry (Bettada Nellikai in Kannada ; Kattu Nellikai in Tamil). Cut the top portion of it and light the Ghee diya on it and offer aarti to Sacred Fig Tree (Arali Mara in Kannada ; Arasa Maram in Tamil) and after aarti keep it under the tree and offer your prayers. Follow this procedure to avoid delay in Marriage. This procedure is special for both Lord Vishnu & Lord Krishna. 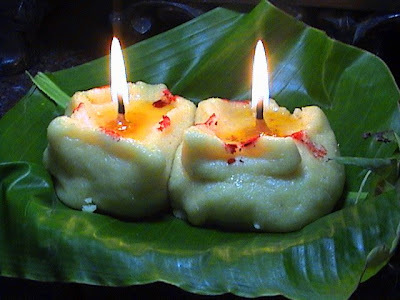 One should first prepare 16 numbers of small Rice Flour Lamps (Rice Flour balls mixed with Jaggery and with small amount of turmeric powder). It is known as Maa Vilakku in Tamil and Akki Thambittu Deepa in Kannada. The person who is bedridden should touch it and offer his/her prayers at home. Any Family member can take it to nearby or faraway coconut tree (kalpa vriksham) and offer aarti using it. After aarti keep under the tree and your prayers to the tree. One should offer aarti using Jaggery ghee lamp to Lavender-leaved Leucas Plant (Devva Tumbe or Hasiru Tumbe Plant in Kannada ; Dronapushpi in Sanskrit). After aarthi keep under the plant and offer your prayers to plant. Thanks for information regarding delay in marriage. Do we need to repeat this ritual. On which day and time we can perform this ritual. You can do it on any auspicious day or in any auspicious time. Regarding repeating this ritual Guruji didnt reveal anything. According to my knowledge you can do it for 11 weeks i.e once in a week.